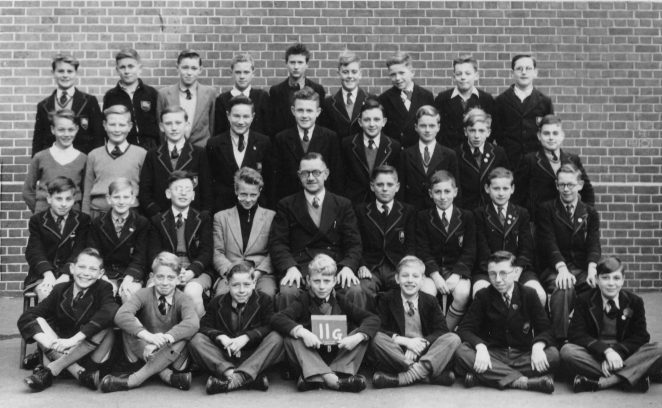 I attended Fawcett Between 1954 and 1959. I learnt a lot about the misuse of authority and a few other things as well. The form master here was Jaz Bolton. He was ok. Firm but fair. The photo here is from either 1955 or 1956. I will fill in as many names as I can. Front row – Mickey Harris; Hugh Beeson; Chris Sharp; Mickey Haslam; ? ; Gary Turner. 2nd row - ? ? Hugh Douhney. ? Jaz Bolton. ?; ? ; ?; ? Back row– Sam Weller; Paul ? ; Bob Collins; Clive Parkin; ? ; Geoff Minter. David Langston; ? I had a fantastic time at Fawcett , made a lot of friends, who I unfortunately did not keep in touch with. It was the friends that made the experience fantastic, not the school. Can you put some names to faces? If you can, please post a comment below. Front Row: Michael Harris,Hugh Beeson, Chris Sharp,Michael Haslam,Geoff Wares,? Gary Turner. I hope that I have got at least some of these right! Well done to Peter Butcher for posting this photo. Peter (who currently lives in Sweden) and I keep in touch and should anyone wish to meet I will be happy to make the arrangements please contact me. Front row 2nd from right is John Francis. Front row 2nd from right is John Francis, 3rd row Ken Arthur, 2nd row 2nd left me, Alan Brown is next to me and Henry don’t Nathan was his brother. Well done Peter for setting this chain of memories up and thanks Chris for suggesting we try to meet up. I wonder how many of the class are left, now that we must all be around the 75 mark! For me time has been spent mainly in the Army (40 years) and in Sport (took up Dragon Boat Racing). Great if we can get the class back together, count me in. Now living in Bognor Regis Mob 07910 200 331. Mike Haslam (front Row with class board). Good to hear from you Mike. Peter and I are meeting on 6 th 0ctober 12.30pm in Brighton and if any of our “old boys” would like to join us it will be great. I understand that Peter has been in touch and that you will be at Bankers Fish & Chip restaurant in Western Road. Looking forward to meeting up again. If you or anyone wishes further information then please contact me 01444 245743 or 07778 233794. Apology…….I should have advised that the meeting is actually on 3rd October NOT 6th. I am sorry for the mistake here but hope that this will not interfere with any plans that have been made.Old age is cruel! Hope to see you on 3rd.